Review date: 11 January 2003. Since the last time I checked out wireless networking gear, it's become cheaper, and commoner, and easier to use. This isn't surprising. Information technology that doesn't follow this path is the weird stuff. Thanks to lower prices and higher gain antennas, both commercial and home-made, wireless links are now lacing the suburbs and the hinterland; normal human beings, meanwhile, are just enjoying not having to run cables everywhere to set up a LAN. And new wireless standards are popping up. The puzzle, as always, is what to choose, and why. Bluetooth isn't a Wireless Local Area Network (WLAN) protocol, although it can be bludgeoned into performing that function, after a fashion. It's meant, rather, to be to WLAN connections as USB is to Ethernet connections. Bluetooth is for connecting computers to peripherals and other gadgets, not for connecting computers together in peer-to-peer fashion. And now that Bluetooth 1.1 devices are common, it actually pretty much works. Bluetooth uses the same minimally regulated 2.4GHz radio band as is used by the common IEEE 802.11b WLAN system, but Bluetooth has much lower bandwidth, and isn't meant for long range connections. 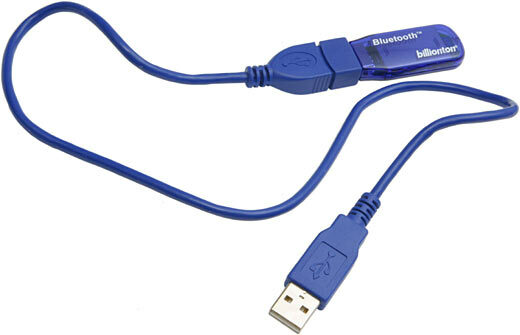 Bluetooth should work through a wall or two, despite the weeny low-power transceivers normally used for it, but you're meant to use it to connect things that're close enough that you could easily plug them together with a cable. It's just nice to not have to. A few motherboards, and various laptops and brand-name PCs, come with Bluetooth hardware built in; so, now, do lots of higher-end mobile phones and palmtop computers and such. 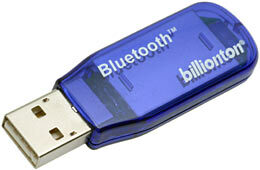 You can add Bluetooth to any USB-equipped PC, though, with a simple little plug-in widget. A year ago, Bluetooth's utility for normal home and business purposes still wasn't high. Now there are enough gadgets that support it, and mature enough software support for them, that you're likely to be able to sensibly justify buying a Bluetooth adapter for your PC. ...and it comes with a cable to let you more easily connect it to a PC's rear USB ports. This is a Class 3 adapter, which means its maximum specified range is only ten (unobstructed) metres. That's fine for normal Bluetooth tasks, but if you need more range you'll want to buy a larger Class 1 adapter. They're meant to work at up to 100 metres, with a following wind. If you want to use Bluetooth to connect two computers, then you can do it with two of the Billionton adapters, but I think most customers are only going to want one of them. With it, you can easily download images from your picture phone, or sync your personal organiser, or whatever. In the event that you do connect two PCs together via Bluetooth, this is the sort of interface you get. It's also more or less what you'll see when you're connecting to some other Bluetooth device, with differences depending on what that device does. It looks good in screenshots, and it works well enough, but this is one of those flaky, laggy, not-quite-Windows-standard interfaces; people who use Internet Explorer to access FTP sites will already be familiar with the genre. The My Bluetooth Places window is oddly sluggish to resize, for instance, especially if it's displaying another device's available services. And sometimes it goes a bit strange. The operating system thinks of the Bluetooth connection as being a fairly high speed serial port (it's about five times as fast as a normal COM or IrDA port can manage), and it's possible to do regular Windows networking over it, if you like. One of the great advances that Windows 95 brought the Wintel world (stop sniggering, you in the back with the penguin baseball cap) was the ability to easily bind one or more network protocols, and clients for various network services, to arbitrary network interfaces. Since Bluetooth is just another network interface from the point of view of any vaguely recent Windows flavour, you can just bind the appropriate protocols (TCP/IP...) and services (Client for Microsoft Networks, File and Printer Sharing...) to the Bluetooth interface on a couple of computers, and away you go. Not terribly quickly, mind you - more on that in a moment. But using Bluetooth to make a simple little wireless LAN between two computers works fast enough that normal network operations won't leave you scratching your head and wondering if there's time for a cuppa before the Network Neighborhood updates. And yes, Bluetooth will let you play games with your coworkers on the other side of the partition without incriminating UDP traffic showing up on the company LAN. You can even get Bluetooth Access Points (APs), which work the same way as regular WLAN APs; you plug them into your wired LAN, and up to seven Bluetooth-equipped gadgets can connect to the LAN through the AP at once, using PPP over Bluetooth. For an interesting article on doing this, and how it compares with 802.11b, look here - but ignore the part about cable modem speed at the end. Bluetooth is quite well matched to DSL download speeds, but cable modems whose speed hasn't been quite seriously capped by an ISP can deliver a few hundred kilobytes per second from appropriately fast servers. Bluetooth can't move data that fast. Never mind TCP/IP and APs and Internet sharing and wireless headsets, though. What Bluetooth is actually used for, when it's used for something practical (maybe syncing your organiser with your desktop machine is practical, but I think the jury's out) is just shifting files back and forth. Unless your Bluetooth gadget uses proprietary software, you'll probably move files using plain old FTP. One directory on the device at each end of the Bluetooth link is exposed to the other machine, and you access it like any other FTP server; all you need is the Bluetooth connection and an optional login password for the other device. In my tests, two Billionton adapters managed to move 40 to 50 kilobytes per second of user data via FTP, when they were a few feet apart in an area with little 2.4GHz interference. The theoretical peak bandwidth for Bluetooth is 723 kilobits per second, which is 88 kilobytes per second (remember, a kilobit is 1000 bits, but a kilobyte is 1024 8-bit bytes; if you don't like that feel free to join the rag-tag band of the "kibibyte"-users), but that's the theoretical peak. The peak bandwidth numbers for various data interfaces are usually perfectly accurate; they do indeed tell you how much data per second gets sent at one end of the connection, which that may even correspond to the amount of data received at the other end. Peak numbers, though, don't take into account "overhead" - anything in the data stream that isn't the bits that you, the user, are trying to move. Quite a lot of extra data has to be wrapped around your data to tell the receiving computer what it is. There's further overhead from errors, which always happen in any real wireless system, and which can have a big effect on throughput. Translated, this means that 50 kilobytes per second is about all you can expect from Bluetooth. That'll do for most purposes, but persons seeking a way to dump 2Gb of MP3s onto their laptop before they take it on the road, and who do not have a spare eleven to twelve hours, should look elsewhere. The not-so-great Widcomm drivers from my last Bluetooth adapter review were still installed on one of my test machines; they recognised the Billionton adapter just fine. Fortunately, the Billionton software installed over the top if them without a problem, and without the 103 dialogue boxes that the Widcomm installer spawned a year ago (read the last review for more on that little clickfest). The software you use with your Bluetooth adapter can make a big difference to its behaviour. Different Bluetooth "stacks" (so called because the software is a "stack" of hardware drivers, and lower and higher level communications protocol software) are all meant to be perfectly compatible. So, of course, they are. In other news, elephants fit through keyholes. The "My Bluetooth Places" interface that Windows gives you should always be the same no matter what Bluetooth stack you're using, but that doesn't mean it'll work. No Windows version has its own Bluetooth stack (yet), so we're still in the same situation we were in back in the days when the Winsock TCP/IP stack was your best bet for getting your (Win3.1) Windows box on the Net. That said, the Billionton software seems very good. So's this adapter's chipset; it would appear that there's a CSR chip in there, which means it ought to behave itself very well. It's still not guaranteed that this adapter will talk to every Bluetooth device out there, and I don't have a pile of Bluetooth gadgetry to test with it. But if you do have a problem, it seems likely to be the fault of your $1000 fancy-phone, not your $99 Bluetooth adapter. I'm sure that'll make you feel much better. Australian shoppers who'd like to buy one of the Billionton adapters from Aus PC Market ($AU99, delivered!) can check it out here. Back in the distant pre-802.11 days of, oh, 1999, the only wireless networking options available to people who didn't have a corporate budget were, frankly, awful. Bandwidth only about as good as Bluetooth's, miserable range and wall-penetrating capabilities (commonly, the wireless gear would only work well in a situation where you could easily have just run a cable...), lousy latency, alarming packet loss, and a charming assortment of whimsical software issues. Then, things got better; 802.11b floated down from the expensive end of town into homes and small offices. 802.11b has the substantial advantage that it's now a pretty well established standard. Different makes of 802.11b gear work together quite well (including Apple's "AirPort", which is essentially just rebadged 802.11b with Wired Equivalent Privacy (WEP) turned on by default), the drivers behave themselves, and there's a good selection of reasonably cheap off-brand gear out there. For home and small office users, 802.11b only has three problems. Problem one - it runs in the 2.4GHz band, which may be well populated with other broadcast sources, where you live. Microwave ovens, for instance, use 2.4GHz; your oven does not need to be dangerously leaky for it to noticeably affect 802.11b traffic. 2.4GHz is also not good at getting through obstacles; the reason a microwave oven works is because 2.4GHz radiation is absorbed well by water. That means that 2.4GHz wireless network traffic is hard to push through a tree, or a human for that matter; plenty of other objects present obstacles to it, too. Problem two - it's insecure. 802.11b networks are hard to secure, because the networking protocol is, fundamentally, not meant to be secure. It's like Ethernet; Ethernet's not secure at all without higher level software involvement. Most Ethernet LANs - and pretty much all small office and home LANs - use minimal-to-zero security; anybody who plugs in can access all of the network resources, access the Internet on the LAN-shared connection, and so on. To plug in, though, an interloper has to actually be on the premises with a computer. Wireless networks let someone sitting on a hill a mile away, with a small directional antenna, connect as if he or she was right there in the building. Sneak a wireless access point onto a company network inside the firewall, and you can crack that sucker wide open. This has given rise to a small but amusing industry, including some unexpected products. Right now, though, we've got WEP. Things may get better in the future, but I wouldn't hold my breath if I were you. WEP is better than nothing for keeping J. Random Wardriver out of your WLAN, but it's not a lot better, because it's famously insecure. If you want any passer-by to be able to connect to your 802.11b network, then that's fine; just don't turn on WEP at all, and broadcast the SSID. Most people who're doing one or both of these things, though, don't even know it. Problem three - 802.11b's not terribly fast. The theoretical peak bandwidth for 802.11b is 11 megabits per second. You'll only get that when you've got a strong signal, though; minimum speed is only one megabit per second. And, once you account for overhead, you get around the same speed as ten megabit Ethernet (as opposed to the hundred megabit Ethernet that pretty much everyone's using today). And you only get that much speed if the network has only one conversation going on at a time. The more simultaneous users you have, the worse it gets; 802.11 doesn't have a separate collision-detection channel, so it uses Carrier Sense Multiple Access/Collision Avoidance (CSMA/CA), which means that when more than one person's trying to use the WLAN at once, each person gets less of a share of the theoretical bandwidth than you'd expect. More people accessing the WLAN equal more overhead; more than about 15 or 20 users per access point isn't a good idea. These 802.11b problems are all being addressed, one way or another. There's a newer (well, newer to market, anyway) but much less popular standard called 802.11a, which seems doomed to remain a niche product (for reasons I'll explain in a moment), but which should nonetheless suit some users very well indeed. 802.11a works, from an end user perspective, the same as 802.11b - except it runs at five-point-something gigahertz instead of 2.4, and has a peak bandwidth of 54 megabits per second instead of 11. Its minimum speed is 6 megabits per second. The higher operating frequency is good, because it moves 802.11a out of the possibly-crowded 2.4GHz band. If your location has a lot of 2.4GHz noise, 802.11a may work tremendously better than 802.11b. 802.11a also won't interfere with existing 802.11b networks, or indeed be visible to them in any way at all. Some people seem to have misunderstood the fact that 802.11a can coexist with 802.11b as meaning that it's compatible with the slower standard; it isn't. But at least it doesn't do it any harm. 5GHz is inherently even less able to deal with propagation obstacles than 2.4GHz, so if there isn't a lot of 2.4GHz interference, 802.11a won't manage full speed operation at ranges as long as 802.11b, all things being equal. If it manages to connect at all, though, it always ought to be faster than 802.11b at the same range. 802.11a isn't, technically, any more secure than 802.llb, but the simple fact that not many people use it gives you some dumb security. Attackers are less likely to go sniffing around the city looking for 802.11a networks, for the same reason that not many car thieves decide to steal a Lamborghini Miura today. Now, this is only security through obscurity; it's analogous to putting your front door key under the mat. But that's still better than leaving the key in the darn door with a pink balloon tied to it, which more than a few WLAN administrators (I use the word loosely) still do. If 802.11b isn't fast enough for you, of course, then a 54 megabit per second alternative looks good. 802.11a has the same multiple-simultaneous-users problems as 802.11b, but there's considerably more bandwidth to go around in the first place. ...but it looks like one from behind. The back panel sports a serial port for setup (though most users will never use it), as well as the usual 10/100BaseT network connector, power input, and recessed I've-forgotten-my-password reset button. The AP has four two-way slide-in-a-screw-head mounting points on the bottom, to allow it to be securely mounted on a wall or ceiling by anybody with rudimentary screw-driving abilities. High mounting is a good idea, if you want to get decent range out of the AP. Its plugpack power adapter only has about a one metre cord, but that's not a terrible inconvenience. An extra feature of this AP that you can't see from the outside is that it supports Atheros' proprietary 72 megabit per second "Turbo" mode. If your whole 802.11a WLAN supports Turbo mode (in theory, anything that uses a Turbo-capable Atheros chipset ought to be compatible...), turning it on should give a worthwhile speed boost. Turbo mode won't magically turn marginal 6 megabit nodes into strong-signal 72 megabit ones, but it shouldn't do any harm. And it'll provide yet more security through obscurity, too. More seriously, this AP supports WEP key lengths up to 152 bits, as well as the regular 64 and 128 bit options. You can also create an Access Control List (ACL) that tells the AP to only allow access to particular MAC addresses; this is a simple way to lock down a WLAN to only the users you approve. Actiontec sell their 802.11a AP for $US249.95; the cards are $US129.95 each. 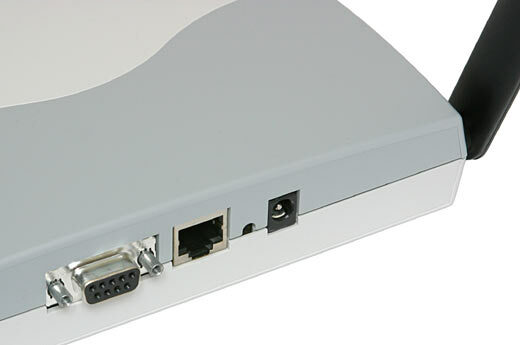 Their older 802.11b gear is $US149.95 for the access point and $US79.95 for network adapters - PCMCIA, USB and PCI adapters are available, versus PCMCIA-only for the 802.11a gear. Hunt around the bottom feeders and you can find Actiontec 802.11b adapters down around $US70, with 802.11a ones around $US110. The low price for off-brand USB and PCMCIA 802.11b adapters now seems to be around $US40 to $US50, though, so that's definitely the way to go if you just want a cheap WLAN, and don't care much about extra features. Setting up the AP isn't difficult. Like pretty much every other consumer plastic-box network appliance these days, it has an HTML interface that you access by just feeding your Web browser the AP's default IP address. The interface, while not necessarily quite as friendly as its name suggests, works fine. There's an installation CD as well, but all it does is show you a tutorial slideshow; you needn't take it out of the box if you've done this sort of thing before. Unfortunately, the quick-start slideshow doesn't tell you about the AP's default login (username Admin, no password) - but that is mentioned in the paper manual. More advanced users can configure the AP using a script, which makes it easy to roll out a multiple-AP network. 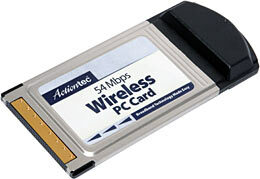 Actiontec make PCMCIA 802.11a adapters, too; as with 802.11b, you can connect computers equipped with WLAN adapters together in "ad-hoc mode", without an access point, if you like. The more usual access-pointed kind of WLAN is called "infrastructure mode". 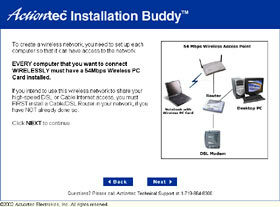 Incidentally, the Actiontec "Wireless-Ready Multimedia Home Gateway" that I checked out last time gets its wireless-readiness from PCMCIA slots, which can accept 802.11a cards as well as 802.11b. Actiontec's 802.11a adapters, like their 802.11b ones, have built-in antennas, and no socket for an external antenna. The Access Point has the usual pair of antennas, but they're non-removable as well (and made of hard plastic, not rubber; they're quite breakable). This makes this gear no use for long range networking experiments - well, not unless you pry the gizmoes open and graft a better antenna on manually. Most wireless LAN tweakers just want a standard external socket, thank you, to which can be connected the can or phased array of their choice. 802.11a's higher frequency means that it won't work with after-market 802.11b antennas, anyway; you'd have to roll your own or hunt around for a commercial antenna for this seldom-used frequency band. In my tests, the Actiontec gear performed acceptably. It could use better antennas, but it's not hobbled by what it's got. In you-could-easily-run-a-cable situations, with no walls or other impediments between the access point and my test laptop equipped with one of the PCMCIA cards, the 802.11a gear delivered around 2.4 megabytes per second of user data transferred - almost 20 megabits per second of user bandwidth. Turbo mode performed as advertised, and boosted throughput past three megabytes per second. Even with only two nodes on the WLAN, though (the AP and one laptop), 20 megabits per second usable from 54 megabits per second actually being sent through the ether is pretty high overhead. Wired Ethernet does better than that; you should be able to shift more than seven megabytes of user data per second over any 100BaseT Ethernet connection that isn't dealing with a lot of other traffic. Still, 2.4 ain't bad. Throw a couple of interior walls into the mix, and 802.11a's connection speed drops to 24 or 36 megabits per second. The two lower speeds tended to alternate in my tests, but they delivered about 0.9 megabytes per second - around 7.5 user-bandwidth megabits per second - which suggests that 24 megabits per second was the link's actual speed. The link speed was quite variable when the reception was less than great, but the speed shifting doesn't cause any dropouts, so it's not a problem. In an ordinary house (never mind an office building), you're likely to easily be able to move a laptop with an integrated-antenna 802.11a card, like the Actiontec ones, out of range of your access point, even if you stick the AP in a central room. Ad-hoc networks of integrated-antenna cards will be even flakier. If you install your access point high up, that'll help; one AP should be able to get coverage of a good-sized slab of partitioned office, if you stick it to the ceiling. 802.11a also seems to be pretty good at managing decent speed even with an almost-lost signal level; I didn't see it drop to its 6 megabit mode often in my tests. But if you want your AP to be sitting on a desk in the front room, and your laptop to be able to see the network when you're sitting at the picnic table in the back yard, then 802.11b is going to serve you better. Or, at least, 802.11a cards with bigger antennas. Network adapters with big "rubber ducky" antennas flailing around present their own problems, of course, but at least you can connect at range. Atheros claim (in a PDF document, here) that 802.11a works OK in an office environment at ranges of 200 feet or more from the AP, and maintains throughput substantially better than 802.11b over all of that range. But that's using a PCMCIA card with an external antenna. With integrated-antenna cards, neither 802.11a nor 802.11b are likely to be terribly good at ranges beyond stone's-throw distance, unless your AP's way up in the air and equipped with a quality antenna of its own. In situations like this, 802.11a is definitely going to be less reliable than its slower sibling. 802.11a's advantages over 802.11b aren't completely compelling. It gives you good bandwidth at close range, but small-antenna network adapters like these Actiontec ones are dramatically affected by quite moderate transmission impediments; 802.11b requires less fiddling to get it to work reliably. In outdoor situations, or warehouse-y environments where the access point can be high up and get line-of-sight to a large area, 802.11a should work well - but that's not where it's going to be used, most of the time. If you're somewhere that's got a lot of interference already in the 2.4GHz band, or where you just don't want to use 2.4GHz because it may interfere with something important, then 802.11a is highly desirable. I'm far from convinced that 802.11a is an excellent long term solution, though. It works well enough, but 802.11b has stolen a march on it. What the world needs is a standard that's as fast as 802.11a, but backwards compatible with 802.11b, and able to use the same antennas. Hey presto - say hello to 802.11g. 802.11g is a 2.4GHz WLAN almost-standard (it's not quite finished yet, as I write this...), which can run at 54 megabits per second when it's talking to other 802.11g gear, and can also communicate with 802.11b. The 802.11g standard is close enough to ratified that various vendors, in a scene somewhat reminiscent of the old modem days, are already selling gear that uses it. Including Apple; their new "AirPort Extreme" is 802.11g. The newness of the standard, though, means that the usual version-1.0 caveats apply. Don't assume different brands of gear will work together, don't assume today's gear from one vendor will work with tomorrow's gear from the same people without a firmware update, and so on. But it doesn't seem likely to be too much of a mess. Some vendors are being more comforting about this issue than others. Actiontec weren't the first to announce 802.11g gear, but they've hopped on the bandwagon now; their "Wireless-G" gear isn't quite on sale yet, but it shouldn't take long to hit the shelves. If there's a heap of 2.4GHz interference in the place where you want to set up a wireless network, then 802.11a will be your salvation. I don't think this standard's going to vanish without trace; it's got a decent niche. But 802.11g looks like a clearly superior solution for many purposes. 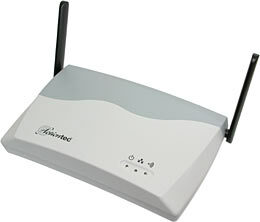 Backwards compatibility, works with 2.4GHz antennae, high speed. What's not to like? 802.11a gear kindly provided by Actiontec. My first wireless networking piece, including info on Ricochet modems, is here.